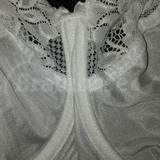 BM Bibi Bianka is a half lace BM in simple white. There is nothing spectacular about this bra, but it is an excellent fit. 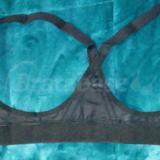 The cups are the BM standard 4 sections: 2 lower vertical, 1 upper horizontal stretch lace section, and an upper outer wedge that connects the strap to the cup. This, like all BMs, is unlined and has the stretch lace on the top of the cup. The band measures 23.125” and stretches to a max of 30”, so it’s really stretchy. It has 3 hooks and 4 rows of eye loops. Like my other half lace BMs, I love the comfort and fit of this bra! It’s so comfortable and cozy. I would prefer the band to be smaller/tighter, but have gotten used to needing the tightest hook-set from the start, so I can wear this comfortably this way. The Half Lace BMs are my Bra Bliss, and my only complaint is that there are not more color varieties available for them. Honestly, they are the most comfortable bras I own. Funny side note, my husband told me (jokingly) that he wasn’t going to take photos of this one since it was white and looked like underwear. I hadn’t thought of it, but this is the plainest bra I own! Lol so does he think your more colorful bras don’t look as underwear-y? That’s hilarious. I’m itchin to try a half lace BM! I do love the half lace BMs. I get a much better fit with them, just wish they had a bit more flare!